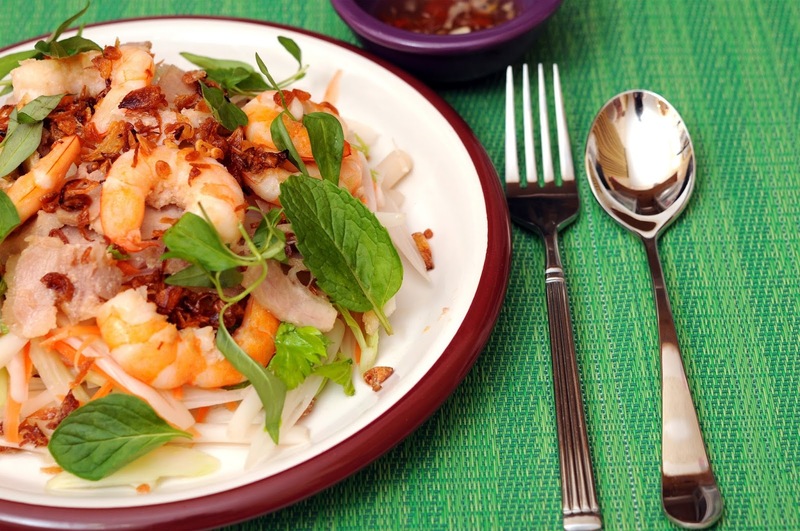 Vietnamese traditional food is famous for its delicious - healthy - cheap street side dishes which are suitable for all people. Vietnamese dishes carry the soul of Vietnamese people and represent the distinctiveness of each region throughout the country. Vietnam is a wonderland where healthy and delicious food are always available and the most natural flavor of the ingredient is loved and elevated to a whole new level. What is more ideal than the fact that you can have stunning dishes in daily meal but never be afraid of gaining weight while your skin keeps whitening and stronger than ever. 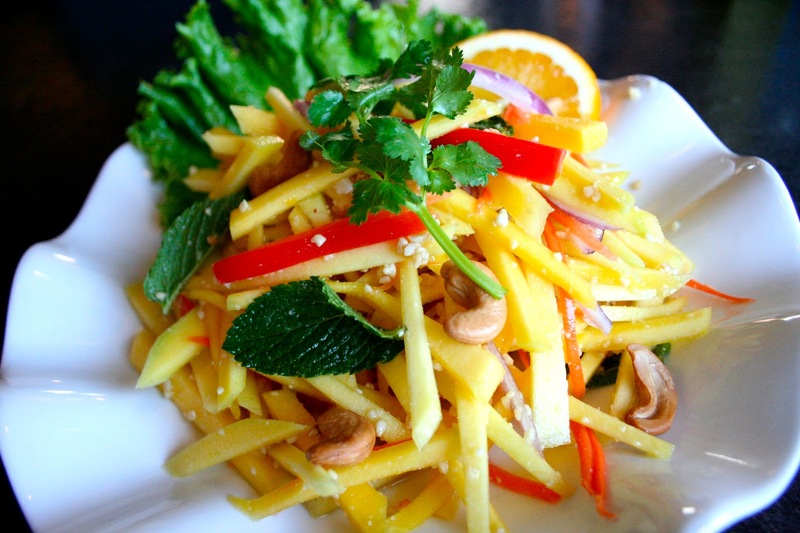 It is Vietnamese salad that is the key to healthy side of our cuisine. This kind of food is plentiful in different versions, different combinations but harmonizes in flavor to create the best fresh dish. 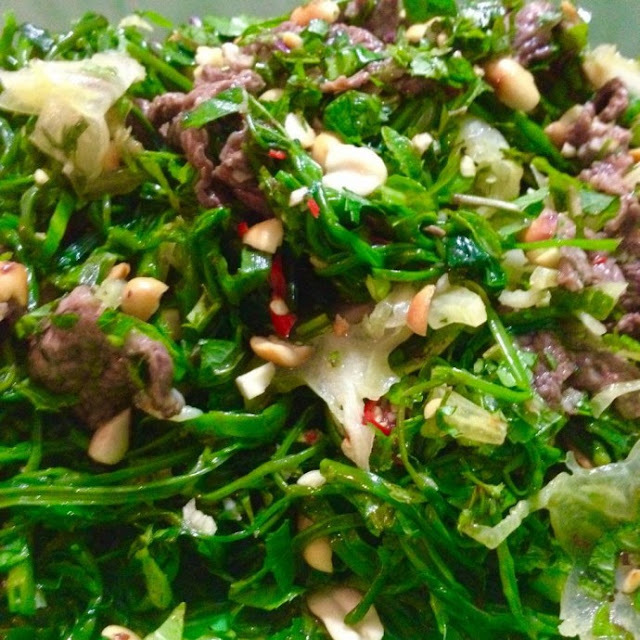 Little is known about when Vietnamese salad (Nộm) was first made but it has been long enough in daily treat of Vietnamese people that eating Nộm has become a culture and Nộm maker has been an artist. 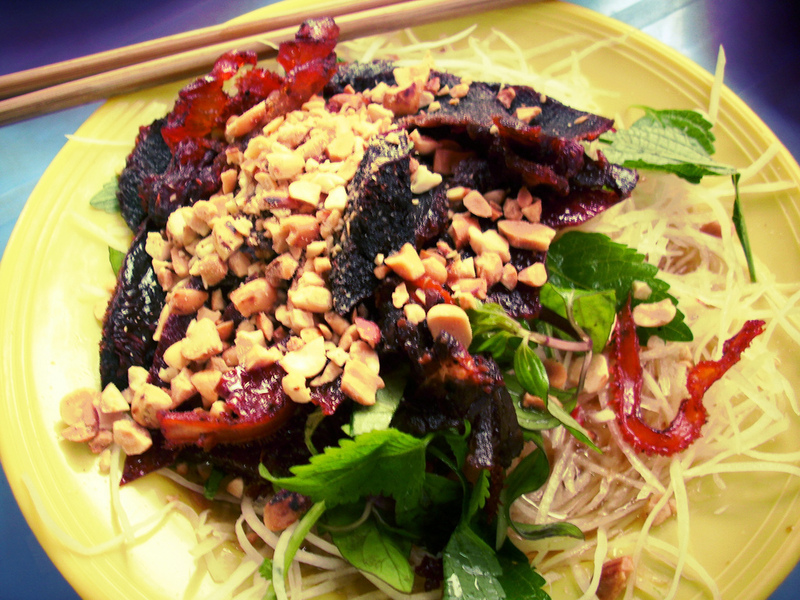 The most popular Nộm dishes in Vietnam include, but not limited to, Nộm bò khô (Mixed dry beef and papaya salad), Nộm hoa chuối (Banana Flower salad), Nộm sứa (Jellyfish salad), Nộm ngó sen (Lotus root salad), Nộm xoài (Green Mango salad). In this post, I will introduce some of them with easy-to-cook recipes for your references. 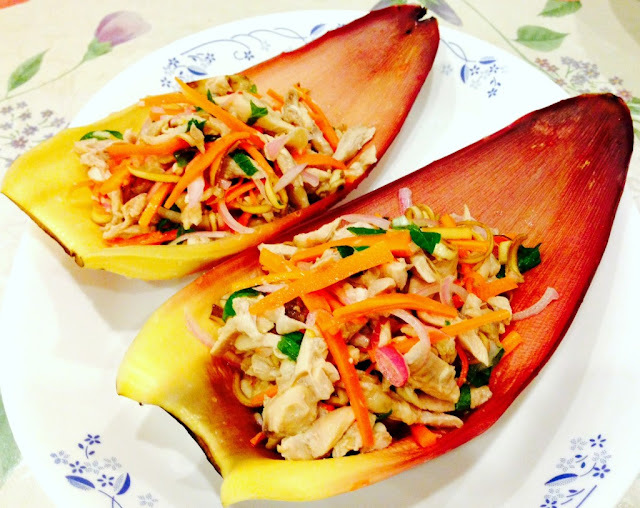 Banana flower salad is a kind of rustic and exotic salad with main ingredients coming from banana, a very familiar tree in country side of Vietnam. Banana flowers (thick purple lumps that will later turn into bunches of bananas) are usually mixed with thinly sliced pork, beansprouts, onion, together with some other spices such as sugar and vinegar. Banana flower salad is one of the popular cold salad from Vietnam, it’s wild in apperance, juicy and crunchy in texture and earthy in flavor. Prepare a large bowl of cold water. Add vinegar into the water. Set aside. 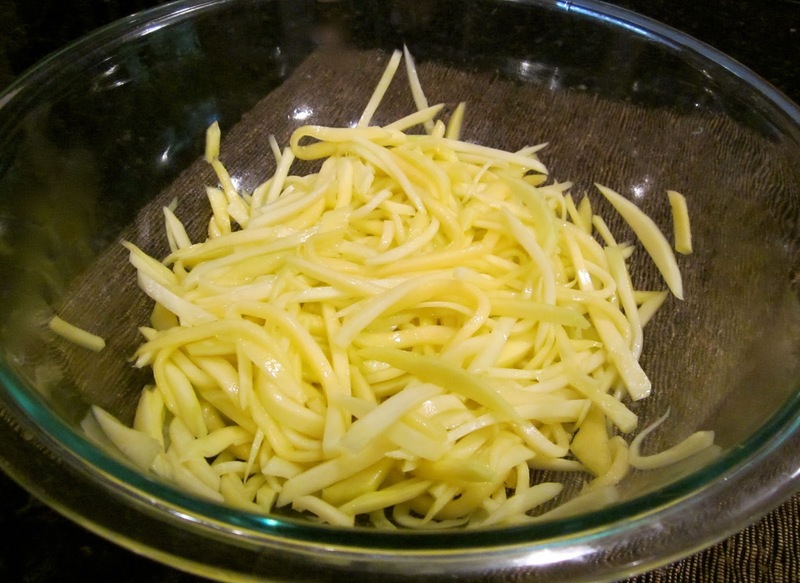 Blanch the bean sprouts in boiling water for 30 minutes and drain. Soak the dried shrimp in hot water for 5 to 10 minutes. Then drain and chop finely. Use a mortar and pestle to crush sesame seeds, sugar and salt. Transfer to a mixing bowl. Then add banana blossom, bean sprouts, pork, dried shrimp, peanuts and rau ram. Toss all the ingredients well to combine. Then add lime juice. Toss well and adjust the taste if needed salt, sugar or lime juice. If you are a snack lover, this crunchy, sour, spicy but buttery dish cannot be missed, especially when you come to Vietnam, where you can enjoy the most genuine green mango and its variant in daily salad. 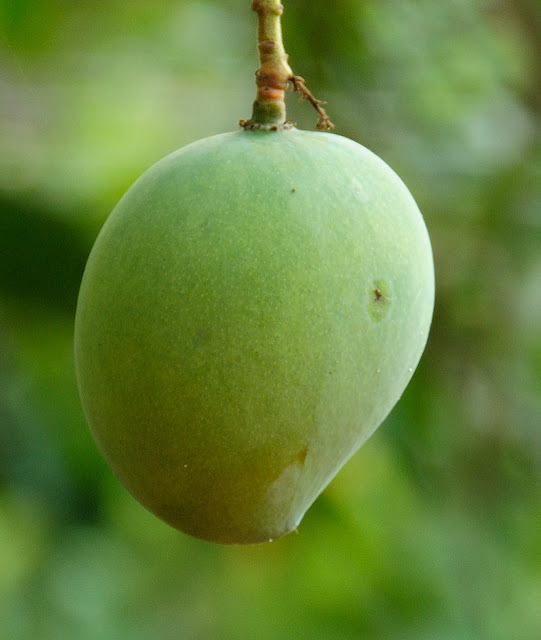 To start, use a sharp knife, trim the end of the mangoes. Peel the mangoes and cut into long, thin strips (or use a vegetable peeler) until you reach the core of the fruit. 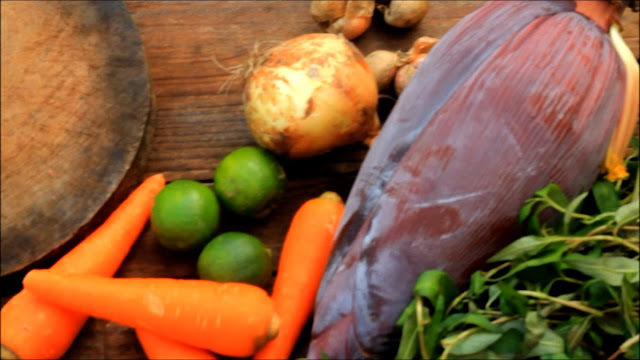 Place the carrots, green mangoes in a large mixing bowl. Sprinkle with salt and granulated sugar. Drizzle with 1 tbs lime juice and toss well. Set aside for about 30 minutes. Salt draws out moisture from the vegetables. Stir dried shrimp with chopped garlic + chili in a pan. Cook until golden then add fish sauce and sugar. Let it cool down in room temperature. Salad dressing: In a bowl, dissolve the remaining sugar in 2 tbs of boiling water. Add the remaining lime juice and soy sauce. Mix in the garlic and red chili pepper. This dish is comprised of crunchy pickled lotus roots, which are an edible rhizome (root) of lotus plant. This crunchy, delicate flavored root grow in swampy underwater environment with white color, mild sweet, water-chestnut like flavor. While pickled carrots and daikon, tender pork and shrimp are among optional ingredients and fish sauce vinaigrette (mixed fish sauce), crispy fried shallot and roasted peanuts cannot be omitted. Boil the pork shoulder in water and a little bit of salt and sugar. Boil the shrimp with the shell on in water. Set aside the pork shoulder and shrimp and let it cool. Rinse out the pickled lotus roots. 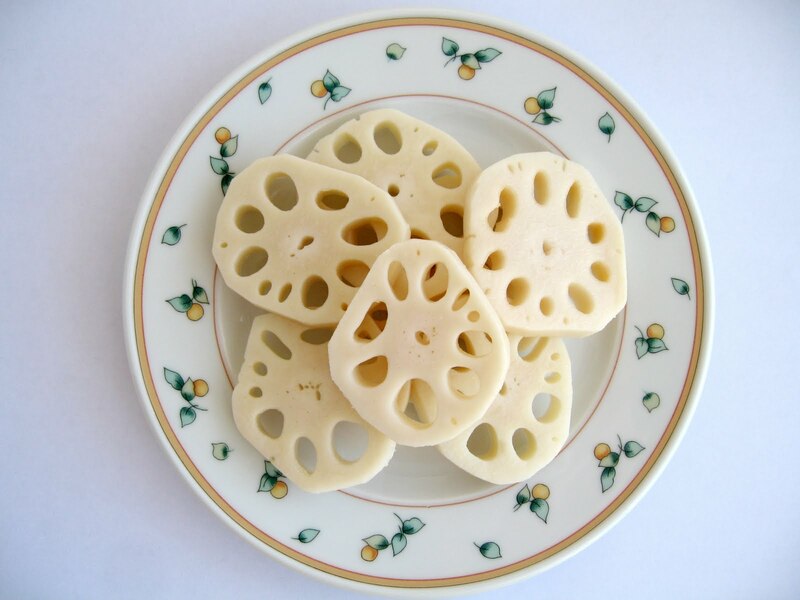 Cut the lotus roots in half, diagonally in bite size pieces. Coarsely chop the fresh coriander and mints. Now with the pork and shrimp cooled, slice the pork thinly. Peel the shrimp and slice the shrimp in half lengthwise at the same time. In a large bowl, mix together the drained pickled carrots and daikon, lotus roots, mint, coriander, sliced pork, and Vietnamese dipping sauce. 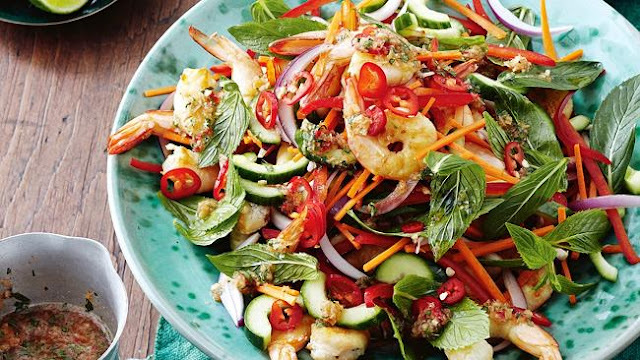 Top the the salad with shrimp, roasted peanuts, and fried shallot. Enjoy this simple, deliciously crunchy Vietnamese lotus root salad. Another version of water spinach that I’m going to introduce in this series of salad will provide you with an amazing combination of boiled water spinach, beef and flavorful dressing. To be honest, if you don’t want to get addicted to this dish, dare not to try it. Water spinach: Remove leaves of the water spinach, let only 2 – 3 leaves at its top. Wash thoroughly with a little salt to prevent it from darkening. Drain. Boil the water, add some salt and scald the water spinach in 1 minute. Take it out, soak in cold water to keep it crunchy. Beef: Scent beef slices with salt, chopped garlic. Stir it fast with 1tbs of oil in high heat. Dressing; 30ml fish sauce + 25ml water + sugar + lime juice. Finish by chopped garlic and chili. Drain the water spinach. Cut star-fruit into thin slices, slightly crush them to get water for pouring water spinach. Mix them well with the dressing. Add ground peanuts, chili slices, chopped herbs) to plate. Lunar March is called jellyfish season. Different from white jellyfish salad which may be available at supermarket, red jellyfish requires more techniques and is more difficult to process. 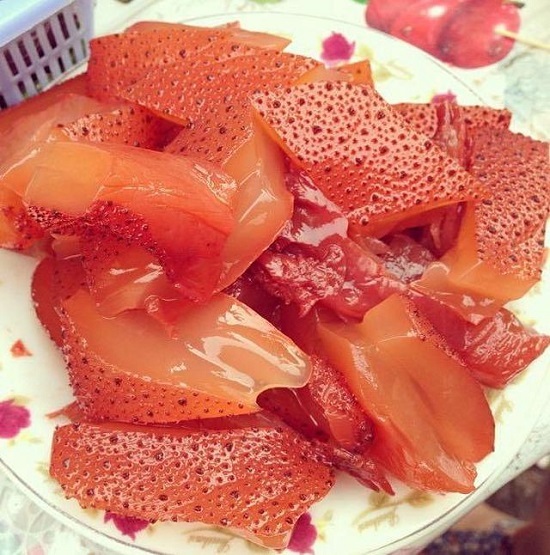 It is said that the jellyfish from Hai Phong once caught is soaked in bark of one mangrove-like tree to have red color and free from fishy odor. 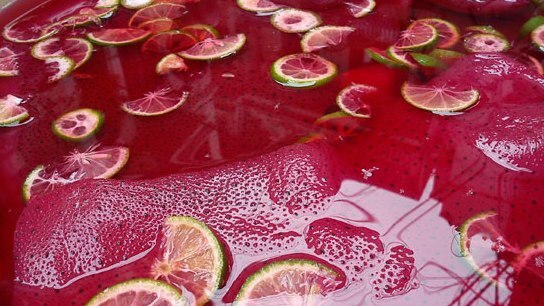 It will be then added lime juice to make the dish aromatic and more charming to any taster. In Hanoi, red jellyfish may be found on street side under a century-old tree in a limited space with hanger and several plastic stools. Each jellyfish serving includes pieces of jellyfish cut by bamboo instead of knife as usual, together with grilled tofu, young coconut, Cockscomb mint, perilla and indispensably shrimp paste. You may feel astonished by a look and first bite at first, but after having courage to try to second bite, you will find it amazing and finish your dish so quickly you’re even unaware. 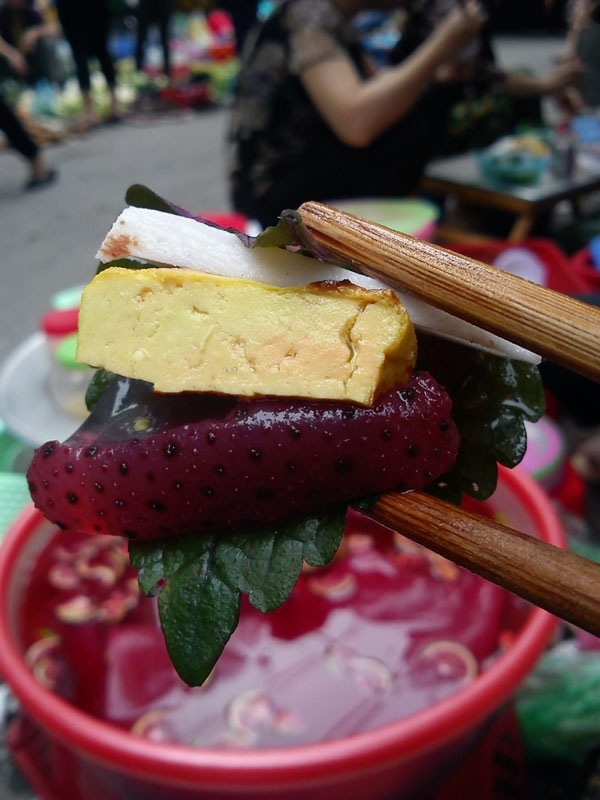 A popular street food for boys and girls, but it also has its own history. As the old of Hanoi, Nom Bo Kho has been in Hanoi for a long time, the ingredients are so simple. 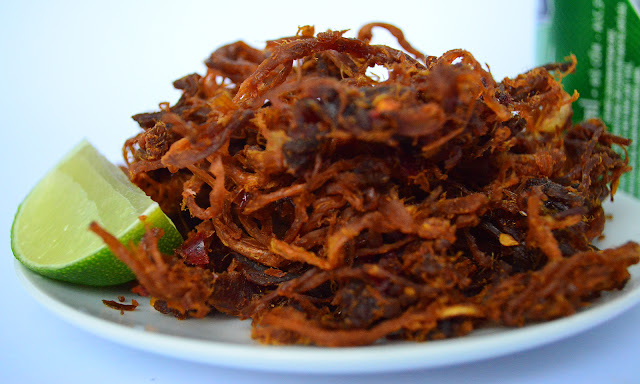 Many people love its spicy taste of fried beef, pepper and the sour of lemon juice and crispy of salad. I also love this food, often come with my friend to some vendor near the university or around Hoan Kiem lake. The funny sound from the scissors what cut fibers of dried beef, good smell from lemon. Hanoi is home to many famous beef jerky salad stalls, such as Nom bo kho stall on Hoan Kiem street, Godfather on Hong Phuc Street, Nom Lim on Hang Bun street, etc. What differentiates such stalls from one another is the owner’s way of beef jerky processing to create his own specialty. Prepare: Remove stump and old stalks of coriander and marjoram. 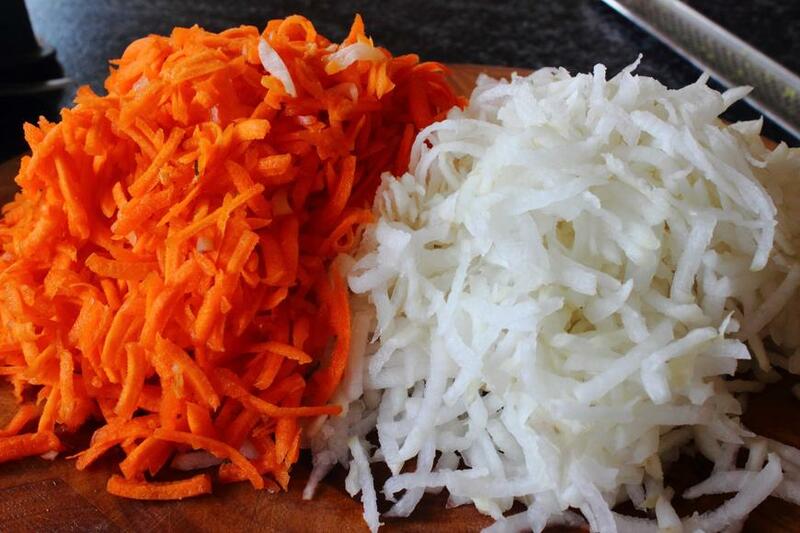 Peel papaya and carrot, clean and slice them into fibers, mix with 2 teaspoon of salt, then crush. It will keep papaya and carrot crispy. Peel garlic, grind. Take chili into small shape. Shred dry beef. Fry peanut until they are ripe. Then peel them, grind into small-cube-shape. Mix papaya, carrot, dry beef and herbs with sauce. Sprinkle dish with peanut. Mix peanut well in the time you enjoy, it will make peanut be crispy. You can use kohlrabi instead of papaya. Do chua (Veggies pickles) from carrot and papaya is very popular in Vietnamese cuisine thanks to its perfect accompaniment in flavor and freshness to broken rice, sizzling crepe, banh mi sandwich, etc. 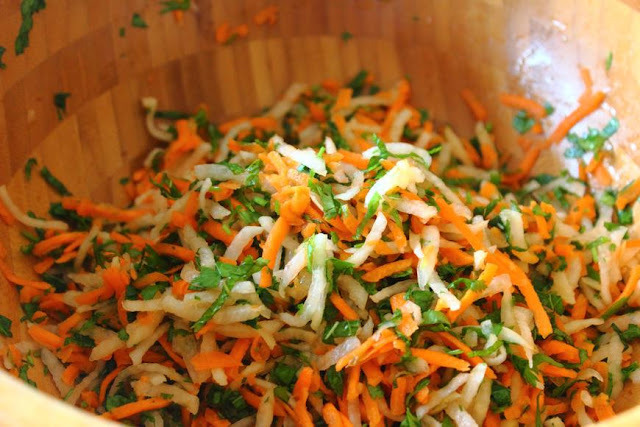 Peel carrot and papaya, cut into thin strips or use a vegetable peeler. Combine carrot, papaya strips and salt in one large bowl with some vinegar for 15 minutes. Drain them all. Dissolve sugar and vinegar in warm water following the ration of 1 warm water: 1/2 sugar: 1 vinegar, pour it into the drain carrot and papaya. Serve with chopped mint or coriander after 45-60 minutes. 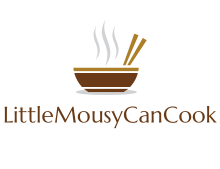 Little Mousy Can Cook is where I introduce you my favorite dishes from Vietnam, together with some techniques that I have learned and collected from experience and other sources. Little Mousy Can Cook is where I introduce you my favorite dishes from Vietnam, together with some techniques that I have learned and collected from experience and other sources. This page may also act as a guide book for any foreigners who wish to visit interesting places and enjoy Vietnamese specialties. Hope you like and support me by giving comments for my every post. Thanks in advance! Weird Vietnamese Food - Dare you try it?